One of the biggest scientific challenges today is the unification of gravity and quantum mechanics. Einstein’s baby or prima donna, his general theory of relativity, described the laws of the cosmos and the birth of the universe, the orbits of the heavenly bodies and the fall of Newton’s apples. Quantum mechanics described atoms and molecules, subatomic particles such as protons, electrons, quarks, etc. 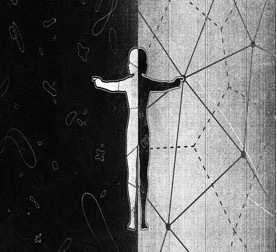 Yet in the places where both theories should apply—where both gravity and quantum effects are so strong, such as spacetime singularities in the big bang and black holes—they also seem incompatible. Despite decades of work by physicists, including a dozen or so Nobel laureates, a quantum theory of gravity remains elusive and we are still stuck with perhaps the biggest incompatibility problem in the universe. The main challenge now is to combine the two ideas into one all-encompassing and coherent theory, to be known as quantum gravity. Such a theory would be crucial for explaining the first moments of the big bang, when the universe was dense and hot and small, or what happens near the singularity at the cores of black holes, where the effects of quantum physics may compete with those of general relativity. So what happens when we try to combine general relativity with the principles of quantum mechanics? Why is it difficult to combine them? What happens when we try to write down a quantum field theory of gravity? First things first before we get down to the brass tacks: One of the challenges amongst physicists and scientist-writers who want to write for a popular audience is to explain abstruse scientific concepts clearly without using too much technical jargon, on the one hand, and avoid oversimplification or “dumbing down” of certain topics, on the other. Another thing is the fact that there are certain demands that editors regularly impose on physicists and other scientist-writers who write complex topics. One: Do not use equations. The saying goes that every equation cut your book sales in half. Another crucial demand is to use metaphor and analogy, interspersed with anecdotes and historical episodes, to give a broadly accessible account of some of the most complex and most revealing insights of modern physics. And I think one of the best analogies in describing the marriage between general relativity and quantum mechanics is brilliantly depicted by a budding popular-science writer who aptly compares Einstein’s smoothly curved space-time landscape to a painting by Salvador Dalí — seamless, unbroken, geometric. But the quantum particles, on the other hand, are more like something from Georges Seurat: pointillist, discrete, described by probabilities. At their core, the two descriptions contradict each other. When combined, explains physicist and popular-science champion Brian Greene, the equations of general relativity and quantum mechanics begin to shake, rattle, and gush with steam like a red-lined automobile. At first sight this might seem not surprising but when we turn back the clock and trace the expansion of space backwards through time and, at the Big Bang, the Universe becomes so tiny (smaller than an atom) that it must be governed by both gravity and quantum theory together. Yet all attempts to combine the theories have failed, resulting in what the scientists called-divergences—where physical quantities (such as the mass of a particle) blow up to infinity. The main reason is the fact that the assumption of general relativity is that spacetime has smooth and unbroken geometry. On large distance scales this assumption works just fine. However, as we probe microscopic distance scales the assumption crashes into what you call the Heisenberg’s uncertainty principle and breaks down. The uncertainty principle tells us that quantum fluctuations cause undulations in the gravitational field—even in the zero-gravitational field of an empty universe. According to physicist Stephen Webb, as we probe smaller and smaller volumes of space, “the uncertainty principle tells us that quantum fluctuations become bigger and bigger. At the Planck length, space itself becomes a roiling, raging tumult.” He further explains that our familiar notions of spacetime—the concept of “here” and “there,” of “then” and “now”—begin to lose their validity. In these conditions, at the Planck length, general relativity fails because the assumption on which it is founded (namely a smooth spatial geometry) fails. The equations of general relativity no longer hold at the Planck length, and this breakdown of the theory manifests itself in infinities, he concludes. 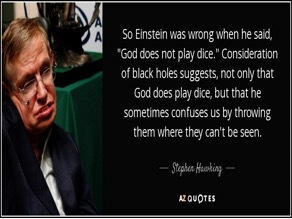 Hawking’s contribution to theoretical physics and cosmology are many including his impact in bringing M-theory to its current state. He has been at the forefront toward solving the “black-hole information loss” conundrum. 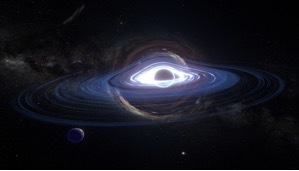 (To the uninitiated, applying quantum mechanics to black holes leads to a puzzle and a paradox, according to string theorist Joseph Polchinski. The puzzle is a black hole entropy; the paradox is black-hole information loss.) His work with Roger Penrose had shown that general relativity broke down at singularities and so the obvious step to take would be to combine general relativity with quantum theory although he had no background in quantum mechanics at all! There are several candidate theories being actively explored in unifying general relativity and quantum mechanics. Amongst the candidates, the two theories are the most popular: superstring theory and loop quantum gravity. The premise of superstring theory is simple. Everything is made of tiny vibrating strings. The strings may be closed unto themselves or have loose ends; they can vibrate, stretch, join or split. And in these manifold appearances lie the explanations for all phenomena we observe, both matter and space-time included. Superstring describes the fundamental constituents of matter not as point-like particles but as microscopic vibrating strings like a string of a violin. Depending on how they vibrate, the strings will be perceived as different particles—including the graviton, the particle thought to carry the gravitational force. Loop quantum gravity, by contrast, is concerned less with the matter that inhabits space-time than with the quantum properties of space-time itself where spacetime is not smooth but built up of discrete building blocks that interact with each other. In loop quantum gravity, or LQG, space-time is a network. The smooth background of Einstein’s theory of gravity is replaced by nodes and links to which quantum properties are assigned. In this way, space is built up of discrete chunks. The quest for the theory of quantum gravity or the “theory of everything” in modern parlance is arguably the biggest challenge facing modern physics. One of the difficulties is that it only really manifests at extremely high energies, well beyond our technology and experimental reach. Physicists now face the herculean task of devising experiments and astronomical observations that can test theories of quantum gravity in the real world. Even the Advanced LIGO and eLISA won’t detect the most eagerly sought-after gravitational waves of all — the primordial gravitational waves created in the big bang. But, hopefully, within the next decade or so, gravitational waves from the big bang singularity will be discovered. Or maybe in this century, some insightful physicists or bright graduate students will discover and unveil the laws of quantum gravity by pure mathematical deduction alone from some fundamental new physical principle. The General Theory of Relativity , not only explained gravity in a new way. It also opened up a window on the origin of the universe. General Relativity generalizes, special relativity and Newton’s Law of universal gravitation, providing a unified description of gravity as geometric of space and time. In particular, the curvature of space and time, or spacetime is directly related to the energy and momentum of whatever matter and radiation are present. Singularity (system theory), when a small change, can cause large effect. Quantum Mechanics, or Quantum Physics, is a branch of Physics, which is the fundamental theory of nature, at the smallest scale of energy levels of atoms and atomic particles. Max Plank, is a German Theoretical Physicist, who originated the Quantum Theory, which clarified our understanding of atomic and subatomic particles ! Elusive can also mean “not meant for standard Physics”… simply because the implications are not for mainstream understanding, much less application. At least not with today’s circumstances. I guess the problem with getting a theory combining gravity with quantum mechanics has to do with the difference in their spatial scales. We can only really sense gravity with planetary scales and masses, whereas quantization factors in when we enter the atomic realm. Combining the four fundamental forces will really be a cool holy-grail thing. Hopefully it will be backed by empirical/experimental evidence, not like Darwin’s theory – evidence of which is just some cartoon drawing. Note: We have never seen DNA form by unaided natural physical forces. If America can invest a billion dollars for some Ligo detectors to hunt down these feeble gravitational waves, they must have some pretty good plans on how to get some ROI out of all this – probably new weapons or enhanced space/time travel. There has been a lot of speculation about the empty spaces in heaven. He explained that the reason it appears that there are dark, empty spaces, is that the gravitational pull of stars inside of themselves is so strong that it bends their light rays back inside, so the stars go out and consequently they do not give out light rays any more. The black holes do not mean that there are no stars there, but simply that their light has gone out and they cannot be seen. The black holes are the graveyards of stars. God said that when our thoughts turn inward, we become just like the stars that are wandering in darkness.